Distribution companies, especially small and mid-sized, lag behind other industries in performance management. The good news is: Today, most distributors are actively seeking ways to revamp their review approach even though this process has been slow, and effective tools and metrics are not yet widely adopted. What can you do to speed up the process? How can you set up a performance management system that will create win-win results? 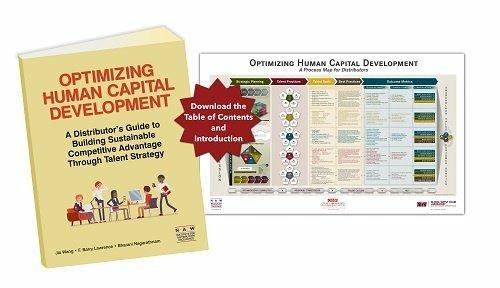 Below are five general guidelines; and for more information, read NAW’s new Optimizing Human Capital Development book. Clarify the overall purpose. Many distributors recognize that their performance review system is not working to the level of their satisfaction. So a key question is: What do you expect from the performance review? What my colleagues and I have found is that most distributors use evaluation results primarily for three purposes: (1) inform compensation decisions, (2) identify high-potential employees and (3) illuminate areas for improvement. Are these your primary or only goals of conducting reviews? To what degree are your goals focused on the past performance? Beyond these reasons, what else do you expect out of performance reviews? Set SMART performance goals. Well-defined performance goals keep employees focused, energized, challenged and motivated. Therefore, the process of setting performance goals should be interactive, involving discussion, collaboration and consensus-making among different levels of management and employees. Well-defined goals are SMART — specific, measurable, achievable, relevant and time-bound. Follow these principles when setting performance goals and make sure your employees clearly understand them. Also, remember: No matter how well your performance goals are defined, they are not set in stone. What is set at the beginning of the year may become unrealistic or irrelevant by the middle of the year because of the constantly changing business environment, so evaluate the goals constantly. Select the right performance measures. It is critical to determine what to use to measure actual results — both the competencies essential to the job and within the areas for which the employee is held accountable. Are you measuring generic traits (for example, personality, style and values), work behaviors, knowledge and skills, or results produced? Each represents a different approach requiring different sets of measures. The key is to understand the pros and cons of each approach, and select one, or a combination, that will fit your performance goals and organizational needs. For example, if the goal is to increase competencies, then knowledge and skill-based measurement will be most effective. If the goal is to focus employees’ efforts on a specific task, then behavior-based measurement is most appropriate. For remedial performance improvement, all of these four dimensions of evaluation can be useful. Focus on the future. Typically, organizations consider performance review at the heart of performance management, thus spending a preponderance of time and energy on review-related activities. While performance review deserves ample attention, it is a past-oriented practice. In other words, what you are evaluating is the performance your employees demonstrated in the past 6 or 12 months. While looking back may help you project future performance, it is a reactive approach in essence. Therefore, instead of focusing on what has not done well in the past, reorient your focus on what can be improved into the future. Seek the employee feedback. Performance review takes place in an exchange relationship between a supervisor (evaluator) and a subordinate (the evaluated). In this sense, the quality of this relationship has a dynamic impact on the perceived effectiveness of the performance review. As research shows (Elicker et al., 2006, and Xervaser et al., 2016) one of the reasons that a performance evaluation system is ineffective, even when well structured, is due to the resistance or rejection from the end users (employees). If employees react negatively to the way their work performance is measured, they are less motivated to perform better. Therefore, understanding the social context of performance reviews, as well as employee reactions to performance reviews (for example, fairness and satisfaction) will help organizations pinpoint areas for improvement. Effective performance management means conducting a thorough and fair evaluation of each employee’s performance that will inform management to make better HR decisions. It also means providing meaningful feedback to employees to assist them for performance improvement and career advancement. In this sense, performance management is both a science and an art. It requires well-selected “hardware” (for example, performance review system and process), and “software” (for example, good understanding of your employees — their reactions to review criteria, content and procedures). When investing time in both areas, your company will be better positioned to make performance management work to mutual benefit. Elicker, J. D., Levey, P. E., and Hall, R. J. (2006). The role of leader-member exchange in the performance appraisal process. Journal of Management, 32, 531-551. Xervaser, A. U., Ahmad, R., Bandar, N. F. A., and Adbullah, S. M. (2016). Perceived fairness in performance appraisal system and its relationship with work performance. Journal of Cognitive Sciences & Human Development, 1, 71-83. Jia Wang is Professor of Human Resource Development at Texas A&M University. As a scholar, she has been actively promoting individual and organizational development through culture-sensitive and evidence-based research. Her research work has been disseminated through a wide range of academic journals and international conferences. Jia currently serves as the Editor-in-Chief of Human Resource Development Review. With 25 years of accumulated experiences in multi-cultural contexts, she has developed and conducted numerous educational workshops to diverse groups in both the corporate and university settings.